Ex-Manchester City legend Shaun Goater has praised Lewes centre forward Jonte Smith. Speaking in an interview with bwin, Goater, who scored 32 times in 36 appearance for Bermuda, singled out fellow Bermudan Smith as one to watch in the future for the national team, and sees in him a lot of potential. In the interview, Goater also pointed out Carlisle United midfielder Reggie Lambe, and Huddersfield Town centre forward Nahki Wells as potential star players for Bermuda. "Reggie Lambe at Carlisle is doing really well. He’s at a club whose manager has more belief in him and is playing him more than he was being played at Mansfield. I would not be surprised if Reggie moved up a level to play in League One, he has the ability to do so. The problem with Bermudan players is adjusting to the aggressiveness of English football, especially the lower leagues. The kick and rush football here isn’t as suited to Bermudan players, who are used to a slower, more technical style of play. "The trailblazer is Nahki Wells, who’s been great for Huddersfield Town since arriving in 2014 and he’s only got better as he’s moved up divisions. He’s a really exciting player for the country and I hope he can continue to push on at Huddersfield and showcase Bermudan football." Smith has been an integral part of the Rooks side since joining on loan from National League South side Welling United in October, scoring six league goals in the process. 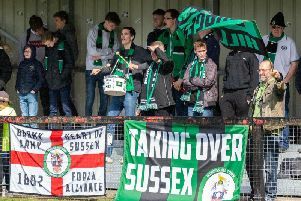 Smith will be hoping that his goals will continue to fire Lewes up the league, as the Rook currently occupy sixth position in Ryman Division One South, only one point adrift of the play offs.